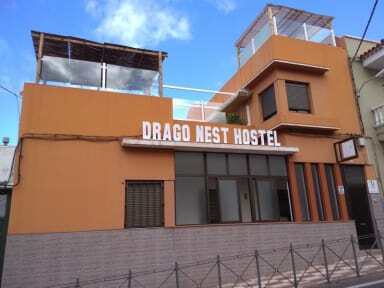 Drago Nest Hostel i Tenerife, Spanien: Reservér nu! We organise activities from the hostel to do cycling or hicking to the mountains around. 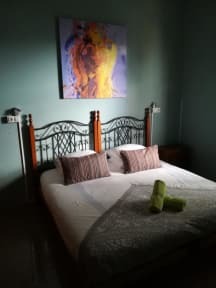 The hostel is 20 min by foot to Cueva de los vientos and drago milenario. Garachico natural rock pools or San Marcos Beach are less than 10 min by car. Masca, Teno or Anaga natural parks are 40 min by car. We do hicking to the Teide mountain that is close as well and you can see it from our terrace. We promote the local gastronomy such as cheese, honey, marmalades, chocolate and the gofio (corn flour). It is in Icod de los vinos, a city in the middle of the mountain. So you have spectacular viewings, the mountain plus the convenience of the city such as coffeshops, bars or markets. Icod is well known for the Drago milenario tree and the Cueva de los vientos (both can be visited by foot from the hostel). Furthermore, to be a little bit more precise, our accommodation is near to several places such as Mariposario del Drago, Museo Guanche and Parque del Drago. Our accommodation facilities are wonderful and marvellous. Right know we have four bedrooms for different kind of customers and different needs. Our rooms are big and all of them are equipped with ergonomic beds, which helps to circulate the blood at night and rest better. 2.- Cueva del Viento ('Wind Cave') underground complex is the largest lava tube in Europe, and the fifth largest in the world, behind a series of lava tubes in Hawaii. It is also considered the most complex volcanic tube in the world, due to its morphology of several levels and passages. It was created by lava flows from Pico Viejo, next to Mount Teide. The cave is located in the town of Icod de los Vinos in the north of the island of Tenerife, Spain. It extends more than 17 kilometres (11 mi) and contains three different levels of passageways, each full of geomorphological phenomena such as lava pits and terraces. The cave is rich in fossils of the 'Canarian megafauna'. Bones of Gallotia goliath and Canariomys bravoi, an extinct giant lizard and rat, respectively, have been discovered here. Archaeological remains belonging to the Guanches, the ancient Berber native inhabitants of the Canary Islands, were found in several entries to the tube system. At present, the Cueva del Viento is a tourist attraction of the island. 3.- Garachico natural rock pools. There is no beach worth mentioning; the coastline is essentially volcanic debris, but this does give the town its charm and a reason to visit it. Near the old port, there has been considerable recent effort to landscape the shoreline. Many paths have been laid as crazy paving, and some natural rock pools made into swimming pools. Rod and line fishing is also evident. However, outside of these rock pools, the Atlantic swell makes swimming inadvisable for all but the very brave. A municipal swimming pool has been built, next to the natural rock pools. 1.- Masca is a small mountain village on the island of Tenerife. The village is home to around 90 inhabitants. The village lies at an altitude of 650 m in the Macizo de Teno mountains, which extend up to the northwesternmost point of Tenerife. 2.- The Teno massif (Spanish: Macizo de Teno) is one of three volcanic formations that gave rise to Tenerife, Canary Islands, Spain. It is located in the northwestern part of the island between the towns of Santiago del Teide, Los Silos, El Tanque and Buenavista del Norte. The volcanic massif, emerged during the last 5 to 7 million years, is furrowed by deep ravines and ends abruptly in the sea, in an area known as Los Gigantes, a series of high cliffs that plummet over the sea. The villages known as Masca, Teno Alto, Los Carrizales, El Palmar, Las Portelas and Las Lagunetas preserve the old agricultural traditions of Canary Islands. The Teno Rural Park is 8063 hectares its features are basaltic lava flows and its plant and floristic diversity that varies widely with each insular microclimate. The zones known as Monte del Agua and Laderas del Baracán are renowned for their forests of laurel typical of the vegetation of Macaronesia. Euphorbia balsamifera and Carthamus lanatus, a variety of thistle abound in coastal areas. The Punta de Teno is the westernmost promontory of Tenerife. It is an area renowned for its marine wild-life offering the best areas for diving. The European Union has designated the Macizo de Teno as a special area for the protection and conservation of the large colonies of pigeons that inhabit the laurel. Ospreys, hawks, kestrels and barbary falcons are also commonly sighted. The area also contains archaeological ruins, with the stone edifices belonging to the ancient Guanche inhabitants of the island. 3.- Macizo de Anaga is a mountain range in the northeastern part of the island of Tenerife in the Canary Islands. The highest point is 1,024 m (Cruz de Taborno). It stretches from the Punta de Anaga in the northeast to Cruz del Carmen in the southwest. Anaga features the mountain peaks of Bichuelo, Anambro, Chinobre, Pico Limante, Cruz de Taborno and Cruz del Carmen. The mountains were formed by a volcanic eruption about 7 to 9 million years ago making it the oldest part of the island. Since 1987 it has been protected as a 'natural park', reclassified as 'rural park' in 1994. Since 2015 it is also Biosphere Reserve and is the place that has the largest number of endemic species in Europe. 4.- Mount Teide (Spanish: Pico del Teide, pronounced: [ˈpiko ðel ˈtei̯ðe], 'Teide Peak') is a volcano on Tenerife in the Canary Islands, Spain. Its 3,718-metre (12,198 ft) summit is the highest point in Spain and the highest point above sea level in the islands of the Atlantic. If measured from the ocean floor, it is at 7,500 m (24,600 ft) the highest volcano in the world base-to-peak outside of the Hawaiian Islands. [a] Its elevation makes Tenerife the tenth highest island in the world. It remains active: its most recent eruption occurred in 1909 from the El Chinyero vent on the northwestern Santiago rift. The United Nations Committee for Disaster Mitigation designated Teide a Decade Volcano because of its history of destructive eruptions and its proximity to several large towns, of which the closest are Garachico, Icod de los Vinos and Puerto de la Cruz. Teide, Pico Viejo and Montaña Blanca form the Central Volcanic Complex of Tenerife.